To those who haven't renewed REMEMBER: We can't help those who, don't feel it's important to help themselves. It's time for attending meetings again. To get things done YOU need to come to meetings! All members of MD FOP 9, please frequent Lamberts Seafood in Glenn Dale MD for great food & cold beverages, please mention that you are a member of MD FOP 9 along with membership card for verification. If you are in need of towing service, please contact Greg's Towing in Riverdale Park Maryland. If you are in need of range time and great deals on equipment stop on by Maryland Small Arms Range in Upper Marlboro MD. To receive any applicable discounts please present your lodge ID Card for verification. 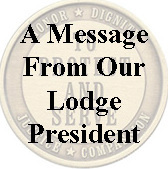 Lodge meetings are typically held on the second Thursday of each month at 7:30 pm in the upstairs meeting hall of PG County Lodge #89's building in Upper Marlboro, MD. * Check the MD State Lodge website calendar page for info on the next state meeting date and location.